Often we become upset, frustrated and demotivated when the same issue that we thought we had dealt with previously arises again and very often, we actually give in, fearing that we can never alter that aspect of our being; we decide we can’t expend the energy or work on ‘healing’ something that keeps coming back again. We believe it is just something that we have to live with. What we do have to realise however is that healing is not a one-off, one-size-fits-all solution but rather a spiral of understanding, acceptance and integration of that which we deal with at varying levels of being until all aspects of that particular energetic resonance are neutralised within our energy and no longer actively influencing our thoughts or choices moving forward. When we consider healing, we need to accept that healing is not one-dimensional but multi-dimensional, multi-faceted – we need to consider healing on a physical, emotional, mental, soul and spiritual level. This is not to say that all issues affect us on all levels but it is very rare to come across things that regularly only affect us on one level. If we take a broken ankle for instance – whilst the primary issue might seem to be healing the physical, the resonance of how we broke the ankle will also impact our energy. If we slipped during bad weather or on uneven ground for example, a fear of not having safe footing might actually be embedded within our energy and might manifest itself moving forward as a fear of taking risks, of stepping onto ‘unsafe’ ground. When we do take risks, we may only commit half-heartedly as we fear putting our full ‘weight’ onto/ into things which may then impact the success of the risk-taking and if a successful outcome is not achieved another layer of dissonance will impact our energy – this time, one of failure and so on and so forth. Long after the physical aspect is healed the energetic aspect connected with that will be gurgitating in the subconscious layers and only through work down the line will we discover what the issue/s we are working on then relate back to. Then comes the work to neutralise or ‘heal’ the impact – not just understanding and accepting its’ impact on our past but also in re-educating ourselves. If we have a fear of water for instance, we may overcome that fear of water. Yet we cannot then just jump into the deep end of a swimming pool as our fear of water will have prevented us from learning how to swim. So the first step after realising, understanding and accepting would actually be to learn to swim – healing the originating issue does not automatically make everything ‘right’, we still have a process to go through. Each time an issue or circumstance arises that triggers a response originating from past circumstances and each time we look at how we can resolve the feelings, fear, apprehension or other emotion related to it, we do so at a deeper level, working on a deeper layer of our energy and subconscious and integrating the understanding and healing in a far more beneficial way energetically. We might think of trying to understand what needs healing and what doesn’t and how do we do that? Yet, if we truly consider it, we all came into this world the same way. None of us entered this life with a set of restrictions, worries, fears or limitations emboldened on our forehead. All of these things that prevent us from taking chances, living an adventure, speaking our truth and so many more – all of these have been imprinted on our energy through experiences that we have been through. So in reality everything that prevents us, everything that engenders a sense of fear (enough to stop us) requires us to work on understanding why and then accepting, healing, changing that response moving forward. Ultimately, as we move through life, we do not heal ‘things’ or ‘aspects’ – we heal ourselves by understanding what has taken us away from wholeness, by accepting that which has changed a naturally courageous, curious energy into one with more reticence and by learning to allow our natural instinctive nature to lead the way. What we can guarantee is that nothing that has been affecting our energy for a number of years is going to be healed in one fell swoop. We should welcome the opportunity to revisit what we feel we have already ‘healed’. In doing so we not only uncover the ability to understand, accept and heal aspects of our psyche at a deeper level than we might have otherwise but we also unfold the probability of expanding ourselves, and our potential to be ourselves, exponentially. 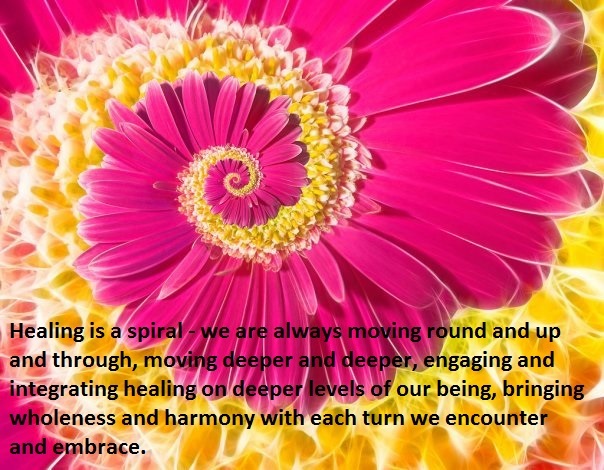 Healing is a spiral – we are always moving round and up and through, moving deeper and deeper, engaging and integrating on deeper levels of our being, bringing wholeness and harmony with each turn we encounter and embrace, moving ever further into being. This entry was posted in awakening, Energy, Healing, path. Bookmark the permalink.